The soybean, like the peanut, can be processed into different food products, making it one of the most heavily processed foods, along with corn, on the market. The soybean’s versatility allows it to mimic certain popular foods like hamburgers, sausage, cheese, and ice cream. Certain soy products, however, have many uses in the cooking process. Along the ladder of rankings, some soy products have more uses than others. Here is a top ten list. Tofu’s malleability and absorption characteristics allow you to cook and flavor it any way you want, making it a top soy contender. Used as a meat substitute, you can stir fry it or sauté it into any recipe you want. Used as a milk substitute, soy milk comes in a close second. You can use soy milk as an ingredient in cooking or in healthy milkshakes. Combine fresh fruit, yogurt, and a couple tablespoons of honey for a refreshing healthy breakfast. Soy sauce contains a low count of protein and lots of salt. It may not be the most popular in terms of a healthy diet, but is used a lot in Asian cooking. Tofu is not the only meat substitution. Other meat substitutions come from soy, namely the soy hamburger. Low in calories and in fat, the soy burger appeals to health enthusiasts and vegetarians alike. Other meat alternatives include soy sausage, bacon, hotdogs, and even fake turkey. Additionally, these soy products are low in fat and in cholesterol. According the National Garden Bureau, edamame, originated in Japan, has grown in popularity in America since 2004. 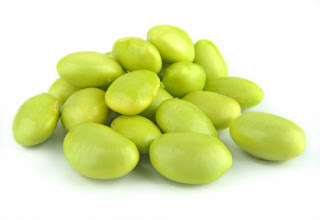 Edamame are the unripe soybeans found in the green pods in which they grow. They are a popular appetizing treat with a sweet and nutty taste. Another Japanese soy product is miso. Created from soy as a paste, chefs use this ingredient to flavor marinades, sauces, and dressings. Miso soup is a popular appetizer in Japanese restaurants. Other soy dairy-like products include yogurt and ice cream. Containing lactobacteria, soy yogurt helps regulate and clean your digestive tract. Soy ice cream is low in saturated fat in comparison to its regular dairy ice cream counterpart. You can also find soy cheddar, soy mozzarella, soy pepper jack, and soy Monterey Jack in your local whole foods store. According to the article “Top Foods Made from Soy”, Americans are still not as aware of the soy product Tempeh as the other soy foods. Tempeh comes from fermented soybeans and is mixed with a grain such as rice or millet and formed into a patty. If you are looking for a healthy change in diet, soy products are often suggested because they offer a variety to choose from so dieters do not get bored with their food choices. With so much variety, you can eat a different soy meal every night! But, beware, soy almost all soy on the market is genetically modified. It contains high amounts of hormones that can have negative effects on the body when taken in high doses (look at the list above and see how much you are taking in). Chances are you are consuming more soy than your body can properly digest. Lastly, all these different forms are processed, meaning it is not a 100% natural, whole food and should not be consumed as your main food source. Be sure to eat only certified organic soy products and only in moderation.